Peugeot is running a unique event at Durham University (Queens Campus) to showcase its prowess in eco-efficient technology, design and expertise in electric and hybrid vehicles. Peugeot is hosting a unique event at Durham University (Queens Campus) on the 22nd April, to showcase its range of current and future ultra low carbon vehicles. Attendees at the event will have the opportunity to be the first in the UK to test drive a selection of Peugeot’s most innovative vehicles. 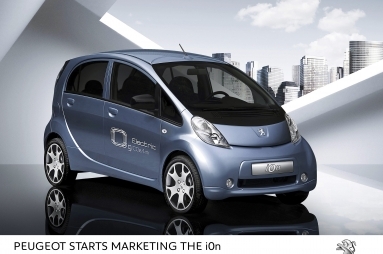 These will include Peugeot’s new i0n four-seater electric car (available in the UK at the end of 2010) and the all-electric Peugeot Bipper and Expert vans. As a partner in the North East region’s Plugged in Places project, Simon Bailes, Dealer Principal of Simon Bailes Peugeot in North Allerton, and Peugeot UK’s Managing Director, Jon Goodman, will host the event. The largest collection of Peugeot’s most carbon conscious technology will be on show along with experts from Peugeot Paris headquarters who will be sharing the latest phase of its carbon reduction strategy with the attendees.